Drain Pipe Expansion Joint Coupling, Rubber, 4 to 4 In. 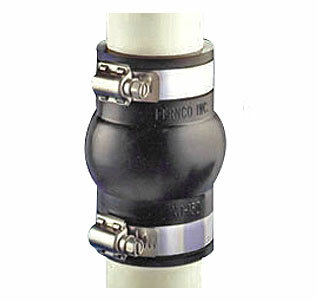 DESCRIPTION: Fernco’s one-piece expansion joints allow for thermal expansion and contraction of drain, waste and vent pipes and inside rain water conductor systems. They eliminate costly offsets normally used to accommodate expansion and contraction. Easy to use expanion joint rubber drain coupler for all types of drains and pipe types. Accommodates up to 1-1/2" expansion and 1/2" compression from the normal position. Unaffected by soil conditions, UV, fungus, normal sewer gases and many acids. Couplings: 2 to 2, 3 to 3, 4 to 4"
Drain Pipe Expansion Joint Coupling, Rubber, 2 to 2 In. Drain Pipe Expansion Joint Coupling, Rubber, 3 to 3 In.